MANILA, Philippines - The full list of topnotchers or top 10 passers for October 2017 Psychometrician board exam is available on this page as officially released on Tuesday, November 7, 2017 or in four (4) working days after the last day of exam. The Professional Regulation Commission (PRC) conducted the Psychometrician licensure exam in the cities of Manila, Baguio, Cagayan de Oro, Davao, Iloilo, Legaspi, Lucena, Tuguegarao and Zamboanga on October 29 and 30, 2017. 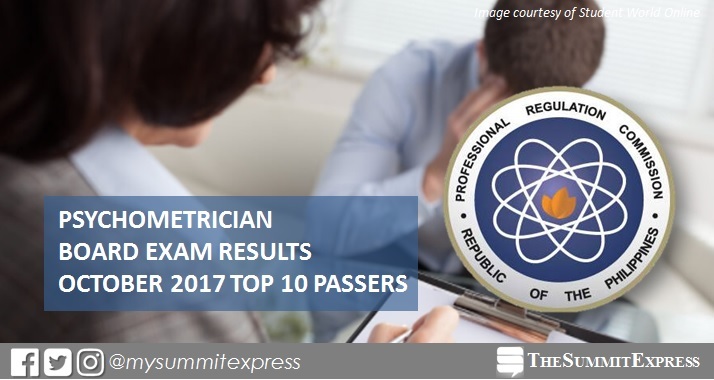 In the August 2016 Psychometrician board exam, Gilana Kim Tan Roxas from Ateneo de Manila University (ADMU) - QC topped the board with 85.60% grade. It was followed by Colegio de San Juan de Letran - Intramuros alum Cheyselle de Vera Cuaresma, with 85.40%. In the July 2015 exams, Van Alistar Hornillos Faeldon from University of Santo Tomas (UST) led the passers with 84.20%. Katreena Carreon Sasis from University of the Philippines (UP) - Diliman ranked second with 84.00%.